Whadda Ya Do With an Outdated Ego State that Has an Attitude? One of my ego states, Cowboy, has been my protector and “can-do person” ever since I was a child. She has always been there for me, always risen to the task when I’ve needed her. I have found Ego State Therapy to be extremely useful in my healing process because this modality enables me to conceptualize the inner workings of my psyche. If I think of my psyche as a place in which all the parts of my personality (ego states) dwell, and if I see these parts of my personality as “people” who interact with one another, then I am able to interact with these parts to bring about peace and, eventually, change. One of the big players in my psyche’s cast of characters is the part that I call Cowboy. Although Cowboy is a girl, she displays some qualities normally attributed to males–toughness, assertiveness that sometimes borders on aggressiveness, and pride in her ability to protect my psyche from “varmints” and nasty critters that might want to hurt me. Yes, Cowboy has existed for a long time, at least I have been aware of her for a long time. When I was a little girl and witnessed another child having her skinned knee kissed by her mother, Cowboy was the part inside me who said, “Well, I don’t need any of that baby stuff. My mother doesn’t kiss my skinned knees, and that’s because I’m tough. I don’t need my mother to do that.” Actually, I longed to have my mother kiss my skinned knees, but my mother didn’t seem to notice them. I learned not to cry because when I cried, my mother got irritated with me and yelled at me. Sometimes she even ridiculed me when I cried. So when my Cowboy said to me, “You are tough. You don’t need your mother to comfort you,” my Cowboy was protecting me from the pain that came with my mother’s neglect and indifference toward me. 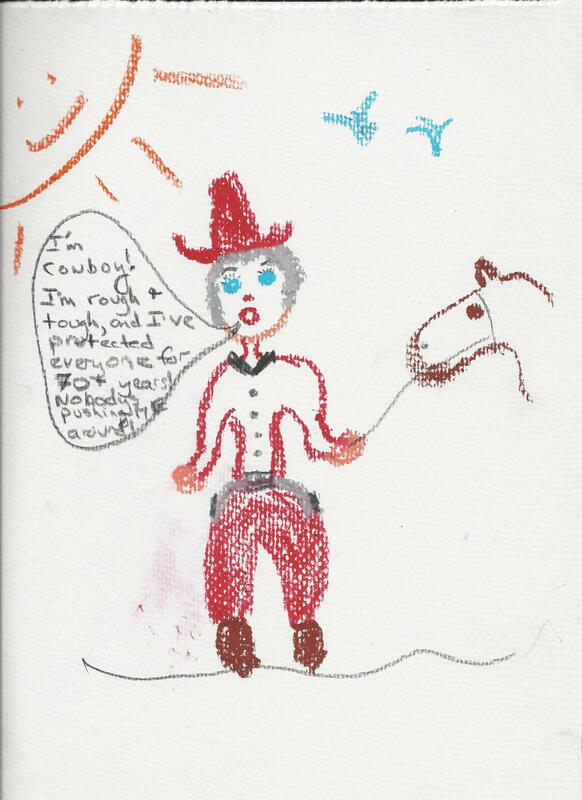 When I was sexually molested by the neighbor at age four or five, Cowboy let me know that I could take care of myself and that it would be better if I did not tell my mother. She would probably spank me and yell at me and tell me it was all my fault. I did not need her; I could take care of myself. And, for forty-two years I did–until I had a huge flashback to the abuse incident and fell apart. 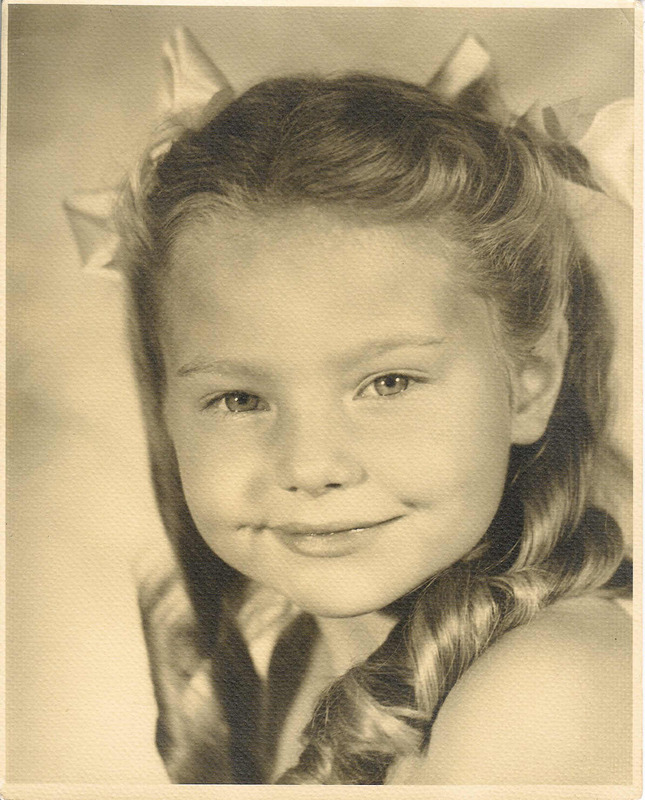 Later, when I was about nine, a friend of the family who had not seen me since I was about four years old said, “Is that Jeanie? 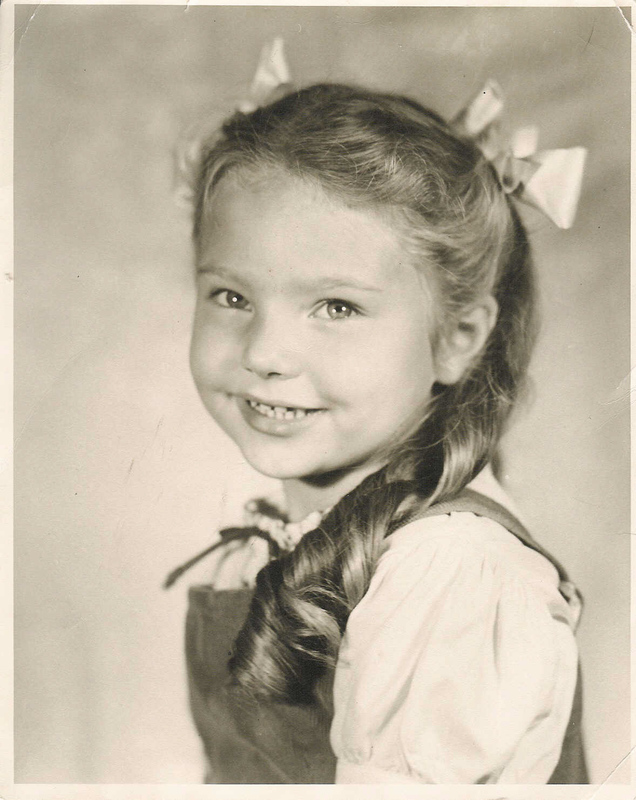 But she used to be so cute!” My mother said nothing to her or to me to soften the effect of her words on me, but my inner Cowboy whispered to me, “Your mother isn’t on your side, and she doesn’t care about you, but you are tough and you don’t need her, anyway. You can take care of yourself.” And I did. I stayed away from my mother. In 1961, when I announced to my mother that I was getting married, my mother said, “Well, all my friends think you have to get married, anyway.” My inner Cowboy let me know, once more, that I didn’t need my mother or her approval, “Don’t let her words get to you. You are tough. Just go ahead with it.” In 1981, after enduring years of an abusive marriage without taking any action to change the situation, my Cowboy took the bit in her mouth when she witnessed my husband molesting our daughter and decided that it was time for action–she led me to confront my husband and tell him I was reporting him to the police, and then she and I did just that. Then Cowboy took the bull by the horns and helped me file for divorce. Yep, Cowboy has been a major player in my psyche. She has protected me from feeling the pain of being abused and neglected, and she has enabled me to survive situations that otherwise might have rendered me permanently nonfunctioning. She has been a true friend when I desperately needed a friend. She has picked up the pieces of my psyche and helped me put them back together again–she rounded up the dogies and brought them home. Now, however, I’m beginning to see that maybe it’s time for Cowboy to relinquish some of her power. I’m seeing, too, that even though Cowboy deserves a medal for helping me survive, she has some rather ugly qualities that detract from her otherwise golden image. You see, because Cowboy has ridden to the fore in rescuing me and protecting me and all the other parts of my psyche, she has developed an “attitude” in the process. For one thing, she is contemptuous of the parts that have not been as forthcoming as she. She sees herself as a hero, rough and tough, and she regards the parts of me that have been more passive as “wusses,” sissies, sniveling cowards, worthless laggards. In other words, she sees herself as superior, better than the other parts. Not good! Rather than join the other parts of my psyche in working together for the good of Jean, Cowboy appears to be drifting into isolation. She appears to be setting herself apart from the others and spending less time in the midst of the community of parts. Why is this happening? My theory is that as I am healing, I no longer have as much need for Cowboy’s help as I formerly did. Cowboy senses that, and she doesn’t know how to deal with the changes in my psyche. I am no longer an abused and neglected child who needs a mother, and I am no longer an abused wife. In fact, for the past thirty-some years, I have slowly taken over the work of protecting myself and have externalized my response to threats without needing her help. Cowboy may be feeling unwanted, unneeded, and unappreciated. The fact is–while her environment has been slowly changing, Cowboy has not adapted herself to that change. How can I help her? Coming soon, I hope: How Cowboy and I come to terms with her need to change. Therapy? Causes of C-PTSD? Healing? Coping? What are YOUR favorite topics? In order to help me decide upon topics for my posts, please reply to the poll embedded in this post. I try to shape my posts so they will provide you with useful information, but because I get so few comments, I am not sure how useful my posts are. So to give me a sense of direction, please click on the three topics that YOU find most helpful. Thank you! Help! How do I find a competent EMDR therapist? Are you doing standard EMDR as it is (a) described in Dr. Shapiro’s text, (b) supported by EMDRIA, and (c) been tested in research? Following the guidelines above will help your chances of finding a competent, experienced therapist who will help you heal your C-PTSD, but these guidelines alone will not do the job. I had a list of guidelines in my mind when I chose my previous therapist. However, the fact that our therapist-client relationship sank like a rock was due in part, at least, to my overriding the red flags of warning sent up by my intuition. Had I paid attention to the message my intuition sent me, I could have saved myself from a very bad experience, an experience that I certainly did not deserve or need! Remember: You have the right to evaluate a prospective therapist and to make sure the person is qualified to help you and is a good fit for you. Try not to be as timid as I was! Do your research on the person, test the waters in an interview, and make one of the most important decisions of your life. My best wishes for a productive and beautiful relationship with your therapist! Last week was an emotionally difficult one for me, a true test of my progress these past few years. My wonderful grown-up daughter visited me for a few days, and we were so happy to spend the time together. Over the past thirty years we really have not had much time simply to be together and enjoy each other. She is married and lives about two hours north of me up I-5 in Washington. I live in Portland, Oregon. Neither of us has much money, and I don’t drive, so we do not see each other very often. We phone often, but phone conversations do not replace in-person visits. Thus, I was glad to see her, and she was happy to spend time with me. Our visit went well. When we said goodbye at the train station, I was truly sad to leave her there. She joined the long line of passengers heading north, and I caught the light rail train and began the trek to my therapy appointment. Oh, how I needed to see my therapist! You see, my daughter’s visit brought back memories of our past (1970s-1980s) when we were living as a family–father, mother, son, and adopted daughter. It’s not that my daughter talked much about those times–she didn’t. However, when we spend time together, little bits of information surface, bits of information that later, when I connect the dots, help me understand the events comprising the darkest periods of my life. (My three-part essay titled “Fallout” will give you some background on this. I posted it to both my WP blog and my Google blog some time ago.) With this new understanding comes an overwhelming mix of emotions–sadness, anger, hopelessness–all the emotions that threaten to drop me into a black hole of depression, anxiety, and despair. After I had left my daughter and had a chance to scan my inner emotional state, I felt the full and sudden impact of a memory I had been suppressing for decades, a memory of an event during my marriage that was so physically and emotionally painful, so humiliating, and so violent that I became nauseated just remembering the event. As I sat in the light rail car and remembered, I worked hard at not vomiting. When I reached my therapist’s office, I settled into a chair and forced my mind to focus on a crossword puzzle until my appointment time arrived. By the time we had finished our EMDR work, my SUDS score had come down to a 4, still too high, but I knew I could function until we did more work to bring the score down further. That was Thursday. Today is Sunday. I have, indeed, gotten through the weekend, possibly because I have socialized a lot these past few days, and socializing–being with other people I enjoy and care about and participating in interesting conversations–helps get me out of my head and shoves painful memories and emotions into the background of my mind. By the time I leave for my appointment tomorrow, my SUDS score may have risen somewhat, but when my therapist and I work on this memory again, I have no doubt my score will be even lower than a 4. We will continue working on the memory until it is simply a memory, something that happened to me, but it does not carry the strong emotional content. Clearly, EMDR is proving to be a valuable tool in my recovering from C-PTSD. If you are working with a therapist who uses this tool, I hope you are benefiting as much as I am. If you are not seeing a therapist presently and would like some tips on how you can help yourself, you may be interested in this book: Getting Past Your Past: Take Control of Your Life with Self-Help Techniques from EMDR Therapy by Francine Shapiro, the person who “invented” EMDR. This book is available through Amazon in paperback and costs less than $15. The quality of this photo is not good because it was scanned from my drawing, so I will explain: I, as a four-year-old child, am sitting on a table. As you can see from my posture, I am ashamed of my nakedness. My twin, the little gray girl, is sitting beneath the table in the same position of shame and humiliation. I could not see that little girl when I was having my photo taken, but I knew she was there. Her presence was my only comfort. Without her, I might not have survived these photo sessions. People are observing me on both sides of the table–you can see their hands extended holding drinks. They are also smoking. I remember the cigarette smoke because it stung my eyes, and I remember the sound of people laughing as they enjoyed their drinks. Below is the only photo taken during these sessions which I have kept. It’s reminder that this really happened, but it does not reveal much of my nakedness. Compare the forced smile in this photo with the genuine smile in the photo beneath. Both photos were taken of me at the same age but under completely different circumstances. The other major player in this excerpt is Gemini, a plodding and gentle old land tortoise that has preserved my/Jeanie’s powers of imagination and intuition. Gemini lives near the water trough behind the stables and near the manure pile where Cowboy throws the soiled hay when she mucks out the stalls. This location is ideal for Gemini because he/she can enjoy the moisture from the dripping faucet and can have fun capturing and eating the tiny insects that emerge from the manure pile–a great dwelling place for a wise old land tortoise like Gemini! A minor player who also appears in this excerpt is I.T., Internal Therapist, the ego state who does what I term “lightweight therapy” as I go about my days. This ego state directs my normal daily process of dealing with ordinary and minor puzzling or confusing interpersonal transactions, the sort of events that may result from unclear communication or missed social cues. Setting: The dining hall of the huge indoor dressage arena on the floor of Jasper Canyon. As the little stream ripples by, day creatures bask on the rocks in the sun, and bees flit from sagebrush to sagebrush. We are aware of the scurrying noises of tiny rodents and rabbits as they search for their next meal. Otherwise, all is peaceful as the sun continues its climb toward late afternoon and early evening. The ego states dwelling inside the arena are just finishing a hearty afternoon meal. Me is sitting with Jeanie so she can discuss the possibility of Jeanie’s spending more time with her beloved horses in the stables of the arena. Jeanie loves the horses and her room in the stable area with its wagonwheel bed, her little rustic pine table, and her closet filled with formal riding outfits, cowboy duds, and fancy dresses, so persuading the little girl to spend more time in the stables is no problem. Let’s listen, now, to the conversation . . .
Me: Jeanie, do you know why we are eating dinner together tonight? Jeanie: Yes, I think so. Gemini has talked to I.T. about helping me with the sad little twins inside me. Gemini thinks he/she can help the twins inside me get happier. Is that what you mean? Me: Oh, yes, my dear. That is why we are having this special dinner. And do you know that I.T. and Gemini want you to spend a week or so here, back with your horsey friends and sleeping in your little wagon wheel bed? Jeanie: Of course I know, Me. And I can work along with Cowboy sometimes and visit all my equine friends once again. It will be just like it used to be, except Gemini is going to help me. And that will mean that Gemini and I will spend some time together. I won’t be able to spend ALL my time with the horses and with Cowboy, will I? Me: No, Jeanie, you won’t, but you will be able to spend a lot of time with them. Is that good enough? Jeanie: mouth full, nods . ..
Me: And you understand that you may experience changes inside yourself during this time? Jeanie: Yes, but that’s kind of scary. Will the changes be good changes? Or will they hurt? Me: You must trust that the changes will be VERY good changes and that none of them will hurt. Jeanie: But why am I going to work with Gemini? I don’t even know him/her. What does Gemini have to do with me? Me: Well, are you aware of the twins inside you, the two sad little girls, one pink and with blond curls and one all gray, that separated from one another? Jeanie: Sometimes. And sometimes when I feel very, very sad, I can hear the one little girl crying. ** But I can’t really tell who it is sometimes. I don’t know if it’s the little sad twin who is crying or if it’s somebody else. But since there aren’t very many parts inside my psyche, then I always decide that the little crying girl I hear is the gray little twin, the one who separated from me when those people took all those pictures of me with nothing on, when my mother did things to me. Ooooo, it makes me all sad to even think about it. Will I feel better after Gemini spends time with me? Me: Our hope, Jeanie, is that you will feel so much better that you will be able to grow and grow just like little girls are supposed to grow. But, I’ll leave that to you and Gemini. Jeanie: When are Gemini and I going to spend time together? And I’m a little scared of Gemini because he/she is a tortoise, and I’ve never known any tortoises before. Will Gemini be kind to me? Me: Of course, Jeanie! Have you ever met Gemini? Jeanie: Not really. I’ve just seen him/her from a distance. Where is he? At that moment, we behold a large, brown bowler hat poking its way around the edge of the arch leading into the dining area, this followed by a reptilian snout and the rest of the tortoise head. Slowly Gemini shuffles into the dining area, pausing to express his/her apology for being late. Me: We understand, Gemini. It takes you a while to get the messages, and then it takes you another while to act on them. But that is okay. Jeanie, here, was just wondering about you, for she has never really met you formally. Gemini: Hi, there, Jeanie. Has Me told you about our plan? Jeanie: Oh, yes, and I’m happy about it! I know there is a sad little girl inside me, and I’d like her to be happy. Can you really help me with that? Gemini: I believe I can, Jeanie. At that, Gemini gives Jeanie such a soft, gentle look with his huge brown eyes that Jeanie knows at once that Gemini loves her and will be kind and gentle as they do their work together. Jeanie: You name, Gemini, means twins, and did you know that inside me are two twin little girls? One of them can remember my happiness at being a little girl, and the other contains my sadness, the pain from what people did to me. They once were just one little girl, the happy little girl, but people did things to me that caused the other little girl, the sad girl, to be born as twin to the happy little girl. I want to be happy, and I want to grow. I don’t like always being a little girl. Can you help me with that? Gemini: That’s what we will be working on this next week, Jeanie. I will do everything in my power to help you grow and to help those two little girls inside you to help you grow. Jeanie: Okay. I’m tired right now, though, and I’d like to go to my place in the stable and visit with my horse friends before I go to bed. May I do that? And will you come and see me tomorrow? Gemini: Of course, Jeanie. Do you want to ride back to the stable on my shell? Jeanie: Oooooo.. That might be fun. But what can I hold on to? Gemini: You see this front edge of my shell? Just lie on your stomach and grab onto that, and I’ll take you back to your stable and to your equine friends. Okay? Jeanie clambers up onto the shell of Gemini, grabs the front edge, and slowly the tortoise lumbers down the hall toward the stables. As they progress toward their destination, Jeanie becomes sleepier and sleepier and drifts into a light slumber, always still clinging to the carapace of the big tortoise. Meanwhile, after Jeanie’s departure, the dining area is abuzz with post-dinner conversation as J.P., Me, I.T., Cowboy, and F.P. lead a discussion on this latest development, the possible changes about to come in Jeanie’s life and the implications of these changes for the lives of everyone at the arena. Because these changes mean possible change for all parts and possible fundamental change in the entire way of life for the folks who inhabit the arena and also for Jean, discussion continues far into the night and ends only when Cowboy notices the first spears of morning light piercing the pre-dawn dark. J.P. hastens to mount Starlight, Constanza and F.P. rush to prepare breakfast, and the usual morning routine falls into place. Yes, the usual morning routine, but for how long? What will Jeanie’s possible change mean for the daily life at the arena? We don’t know that yet, but the time will come when the answer to our question will appear. For now, we must bide our time and wait. **Re the crying little girl Jeanie hears–In 1980 when I first saw a therapist and before I caught my former husband sexually abusing our daughter and turned him in, I would hear a little girl crying inside my head whenever I was under stress. And I was under horrendous stress most of the time even though I didn’t realize it! By 1983, when my first therapist retired and I had found a job I really enjoyed, I no longer was aware of the crying most of the time. Eventually, I no longer heard the crying at all. I do not really understand this phenomenon, but I explain it to myself by theorizing that it may have been my mind’s way of letting me know that I needed help. It could have been a protective mechanism just as dissociation has been a protective mechanism. I don’t know. What I do know is that the human mind is amazing, wonderful, and beautiful, and I thank God that my mind is as efficient as it is! I have another ego state, “Ms. Listen, Understand, and Offer Help If Wanted,” who becomes dominant when a friend talks to me about personal matters. My “little girl” ego state and my “battered wife” ego state become anxious when someone or something in my environment comes across as threatening my safety, and sometimes the ego states that hold the core of my trauma damage react in such a way that they seem to pull all of my other ego states momentarily into that horrible dark space where the negative shadow parts lurk and skulk. The shadow parts, however, scary in their darkness, often lose their ability to scare me when I confront them in bright daylight. In fact, as I have learned while going through this process, parts that began the process as scary shadows often, given respect and recognition, can develop into protectors. Some of these dark shadow parts, in fact, have evolved to become the guardians of the light in my soul. Without them protecting my light, I might be plunged back into the state of despair or darkness that I have experienced at times. The ego states described thus far are not the only ego states in my psyche. I have acquired a multitude of ego states during my seventy-four years of life, and I suspect that even though I recently have managed to achieve a state of relative peace and harmony among them, enough so to reduce my symptoms, I will need to continue working with my ego states to maintain this harmony. So how, exactly, did I know that I needed to do some work with my ego states? When I first began seeing my present therapist, I was constantly being triggered by the environment outside my apartment. I dreaded stepping out my apartment door because I knew that I would encounter somebody or some situation that would cause me to react with that familiar “fight or flight” response or would trigger a flashback or a dissociative episode. Sometimes, depending on what was happening in my environment, I would experience derealization* or depersonalization*. Those feelings or sensations are so uncomfortable and so confusing that I did my best to limit the trips beyond my apartment door just so I could avoid them. The world inside my apartment was predictable, but beyond that door lay the unknown and the unpredictable. Three years ago I did not understand that my psyche was in a state of chaos, as unpredictable and disorganized as the world beyond my apartment door: The ego states inhabiting my psyche lacked connection to one another; they were fragmented. On one of my first visits to her in April of 2010, my therapist told me that before we could work with EMDR, I needed to strengthen my ego. I wasn’t sure what she meant by that, but she said she thought Ego State Therapy would help me do that. When I asked her to explain, I interpreted her explanation to mean that I needed to bring about a more organized and harmonious condition within my psyche, a condition where all my ego states worked together to promote my inner peace and healing. She went on to say that normally a person identifies as many of her ego states as possible and then invites the ego states to a conference so all the parts sit around a conference table and negotiate to bring about peace among them. I have read that ego state work is much like family therapy work, but where family therapy involves working with individual family members to bring about harmony amongst a collection of individual people, ego state therapy works with an individual’s internal family of ego states to achieve harmony. After giving her words much thought, I conceptualized my therapist’s description of the process to be akin to defragging a hard drive in a computer–when one runs the defrag program, all the little bits of information that are chaotically scattered throughout the hard drive are gathered up, organized, and placed so they work together for the good of the entire system. The computer runs more efficiently, and the glitches and retrieval problems are reduced. When a person “defrags” his or her mind/brain by working with ego states, that mind/brain works more efficiently. Mental chaos subsides, and healing can take place. With healing comes a reduction in PTSD symptoms. That has been my experience, at any rate. Thus, motivated to reduce my symptoms, I began my ego state work. Perhaps because I am a writer and have had experience putting myself into a light trance state to access my imagination and my intuition, I decided to write my entire Ego State Therapy process as a dialogue or drama, each ego state being a character. Normally, the work is done in the therapist’s office, but Cowboy wanted to get started and didn’t want to wait for my twice-weekly therapy appointments to get the job done. Thus began the 1000+-page story of my ego states’ interactions. Because my Monday appointments are ninety minutes long, I have used Mondays to read my work to my therapist. She has listened, asked me questions, and helped me when I got stuck. Sometimes, when I simply could not get unstuck, she got out the colored pencils and paper, and I drew what I could not say. Then, when I was at home and had time, I used the material I had drawn to help me verbalize in my dialogue. Eventually, after about three years of doing this, I reached a point where my therapist and I transitioned into EMDR work. My dialogue isn’t finished; it probably never will be finished while I am alive, and I don’t want it to be a “closed book.” I want the book to remain open so I can go back into it and use my characters to help me resolve issues that are yet not resolved. What is important is that in writing my dialogue, I have achieved the outcome I wanted. I have managed to reduce my PTSD symptoms. I can leave the predictability of my apartment environment and walk out the door now without fear of being triggered. I no longer experience flashbacks and no longer dissociate when I hear people arguing loudly or shouting at one another. Also, my bouts with anxiety have decreased in number, possibly because I now feel calmer and more powerful and capable of taking care of myself. Of course, I could not have done my ego state work without the support of my therapist. She has been with me throughout this process, just as she is with me now as we work with EMDR. She listened to me read my ego state dialogue, and she guided me whenever I needed guidance. She was with me in a way that only a therapist could be with me, using her skill and experience–and herself!–to give me whatever help I needed. Most importantly–my therapist has had faith in me, faith that I could do this work and succeed in achieving the outcome I desired. Because she has had faith in me, I have had the confidence I needed to do the work. And now my therapist and I are working together to make sure that I get the most benefit possible from all my hard work. Last Monday, for example, she gave me a lesson in using my ego state work as a tool to help me alleviate anxiety when I feel threatened. I told her that a recent interpersonal situation had resulted in my experiencing the old “flight or fight” sort of anxiety. She asked me if I thought that my little girl ego state and my battered wife ego state needed some reassurance from me, Jean, that they were safe and that I was in control of the situation and would not let harm come to them. Please Note: If you have a history of emotional neglect, reading the following post might be triggering for you. If you do read this and, as a result, find yourself in distress, please call your therapist or try 1-800-273-8255. If you are in Oregon, look on this website for a local number: http://www.suicide.org/hotlines/oregon-suicide-hotlines.html. Many years ago I was enchanted by an amazing film titled “The Red Balloon.” The main character, a little boy about ten years old, Pascal, befriends a large red helium-filled balloon, and their relationship is the stuff of which the story is made. Neither boy nor balloon speaks a word, but no words are needed. 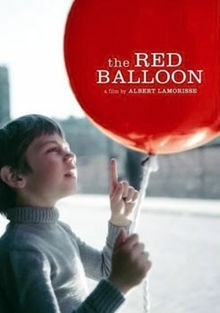 For much of the film, the red balloon follows the little boy, dogs his heels, in fact, to the point where the boy is punished for the balloon’s bad behavior by adults who do not understand that the balloon has a mind of its own. Why not punish the balloon? Nobody, of course, thinks of that! At the end of the film, a pack of envious schoolmates destroys the beautiful red balloon, but does this act destroy little Pascal? Certainly not! A multi-hued cluster of helium-filled balloons from all parts of Paris swoops Pascal up and takes him on a ride high over the city. And there the tale ends. So what on earth does the tale of little Pascal and the red balloon have to do with me and with C-PTSD and with my journey through therapy? Interesting and complex question! I’ll attempt an answer. Last week, I discovered my own “red balloon.” Although my balloon is not a benevolent balloon, it certainly is as faithful as little Pascal’s. It has dogged my heels throughout my life and has seemingly had a life of its own for all these decades. I say this because much of the time I have not been aware of its presence. But I know now that it has been bobbing along, shadowing me for 74+ years, pursuing me relentlessly and with a vengeance. How do I know this? I know because last week it made its presence known big time! It bumped up against me as I talked to my therapist about my early years, and it remained with me as I dipped deeper into depression after I got home. Yes, I’ve given my tenacious balloon a name: essential depression. I say essential depression to mark that its roots are deep in my psyche and go back in time for as long as I have existed. This depression is different from the fleeting, more superficial and temporary sense of depression that descends upon me when I experience a situational setback or the sort of emotional hurt that comes with everyday human interactions that may not be of major importance but, nevertheless, hurt. This essential depression may be familiar to many of you: It’s the sense of hopelessness, helplessness, despair, and total isolation that may come over some of us from time to time–or more often, perhaps. It’s the sense of crawling in the white-hot sands of an immense desert, my knees and hands on fire and my tongue parched but with no oasis in sight. Ravens are circling above, waiting for me to stop so they can make a meal of my body, plucking the gray matter of my brain first, an appetizer. If you really want to know about this desert, read Camus’ “L’Etranger”. One caution: If you tend to pick up on depression, you might be better off to NOT read Camus’ book! As my retired psychologist friend often says: With awareness comes change. I believe that I’m beginning to understand the nature of this balloon, and now that I am beginning to understand it, I believe I can pop it so it no longer dogs my heels and bobs up to make me miserable. My therapist calls this balloon, this essential depression, a “memory.” When she said that last Monday, I thought, “Wow! A memory! If it’s a memory, then it’s not present reality, and if it’s not present reality, then why am I letting it control me? Why am I letting a mere memory make my life so miserable? I don’t want to suffer because of this memory; I don’t need to suffer because of this memory. So I am going to learn all I can about this memory and its origins, and then, when I understand it, maybe some EMDR sessions will reduce the emotional impact.” Sound simple? Well, trust me, dealing with this memory is not going to be as simple as popping a helium-filled balloon, but it isn’t an impossible task by a long shot. In fact, I’ve already begun the task. I have identified what I believe to be the experiences that generated this memory. If you type “effects of neglect on infants” into a search engine, you will find a multitude of articles, some probably more trustworthy than others. For starters, you might read the Wickipedia article that comes up just to get a basic idea as to the effects of neglect on infants, and from that article you might look for others from more trustworthy sites in order to get more details. If you do this research, you will find that infants who are deprived of the attention and quality of care that all infants need for proper development are at risk for a lifetime of physical and psychological illnesses. In fact, even infants in the womb are sensitive to “bad vibes” in their environments and can arrive into this world already emotionally damaged. We come into this world with the neurological “wiring” set to receive adequate parenting; when parenting is inadequate, when we are chronically neglected and don’t receive this parenting, then our wiring “shuts down” much as a computer goes into hibernation mode. The consequences? PTSD, according to some researchers. Well, this is my very simplistic description; I’m a writer and not a scientist. However, my personal experience exemplifies the theory. The good news is that this inactive wiring can be reactivated at any point in life, including the senior years, and the wounds left by neglect can be healed, at least partially, given the right environment. By “right environment,” I mean good and effective therapy and a good, healthy, and effective emotional life situation. All my life I have known that I was not supposed to have been born. I remember thinking when I was a very little girl that I was here by default–God had intended to kill me at birth but had been distracted and simply had not gotten around to doing the deed. But he would remember, and one day when I least expected it, he would do the deed, and I would be dead. That thought, like the red balloon, followed me around all day and caused me to be anxious and jumpy. My kindergarten teacher noted on a report card that “Jean seems very nervous,” but she, not knowing anything of my inner life, attributed the nervousness to a growth spurt. My parents didn’t show any interest in ferreting out the cause of my nervousness. They certainly didn’t ask me! I could have told them, but they didn’t ask. Of course, the sexual abuses I endured added to my nervous behavior, but I did not tell, and my parents did not ask. The fact is that my mother seldom engaged me in a human-to-human conversation, and my father never spoke to me directly except to yell at me in anger when I was doing something that displeased him. So the opportunity to tell never arose. In order to get this product, parents were admonished to leave the baby alone–feed it, clean it, change it, and if it cried before the time for the next feeding and changing, don’t touch it! Yes, babies were mentioned as “it,” as if they were little “things,” objects, and not relational human beings. Touching, according to the manual, spoils children and makes them little tyrants who think they are boss of the household. Babies need the experience of asking for attention and not getting it, the experience of needing and wanting connection with another human being and discovering instead that there are no other human beings and there are no connections. There is only isolation and the misery that goes with it. That, at any rate, is what the cookbook/child care manual in my parents’ bookcase advocated. My mother, having no sense of empathy and no ability to use any maternal instincts and common sense she may–or may not–have had, followed the book to the letter and even passed the wisdom on to other young mothers in later years when they came to our house for coffee and “klatsching.” Of course, what we know now is that the government-issued booklet advocated child neglect, purely and simply. And God knows how many babies were damaged and now as senior adults suffer PTSD or C-PTSD because their parents followed the wise words in this booklet. At age eleven, though, I knew that the “wisdom” in this book was toxic, and I tucked the information into a file in my brain to recall at some future date. I’m glad I did that at age eleven because now that information is helping me unlock the doors to my healing. The information I’ve given above supports the fact that as an infant, I experienced neglect. I also know that for the first month of my life I lived in the hospital nursery–not a place where an infant receives the nurturing of loving caregivers. My mother developed a kidney disease when she was pregnant with me, and since there was nobody at home during the day, my parents boarded me at the hospital for the sum of $1.00 per day. For about a month I lived in a white metal hospital crib and was fed, changed, and cleaned every four hours. Possibly the various shifts of nurses visited me and cooed over me, but I don’t know that for a fact. 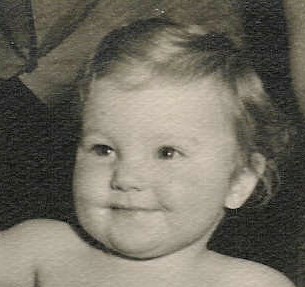 I was an attractive baby, so maybe they did. But maybe not. When my parents finally took me home, my mother was still recovering from giving birth and the kidney problem, so I can imagine that she did not have much of herselfto give to me. But, then, she didn’t seem to have much to give me at any time, as I recall. I remember that at some point in my eighth year I became aware of what seemed a fundamental truth in my life: I was on one side, and everyone else in the world was on the other side. On the side of what? I wasn’t sure, but I did know that if I was to get through my life, I could not expect any help. Nor did I deserve any help. Obviously–to me, at any rate–I was essentially worthless, so I had no right to ask for help or to expect any help. So I decided I needed to be as self-sufficient as possible in order to avoid the certain pain of rejection that would come if I asked anyone for help of any kind. Because I was a child and thought as a child thinks, the notion that my parents might have been worthless as parents did not enter my head. And then one day when I was about forty, my mother’s words inflated this balloon I’ve named essential depression to the point of bursting. The balloon didn’t burst, but it came close. At one point, as my mother and I were engaged in a discussion regarding the condition of the house my family and I owned, my mother said, apropos of nothing, “You were supposed to have been aborted, but I didn’t go through with it because I was afraid I’d die.” She did NOT say, “. . .because I wanted you.” She said, “. . . because I was afraid I’d die.” I was stunned! After a long pause, however, I asked her why she told me that. Her response was, “I just thought you should know.” I remembered that response, and a year later I asked her the question again. Again, she said, “Oh, I just thought you should know.” She’s dead now, and I’ll never know why she thought I should know, but whatever reason she would give me now doesn’t matter. I believe I know the reason: My mother had no sense of empathy, or if she did, she completely ignored whatever she had when it came to me. Why else would she have repeatedly said to me when I was a pre-teen, “Jeanie, you are built like a brick toilet”? Why else would she have said to me when I was a teenager, “Jeanie, you have such a pretty face. It’s too bad you are so fat”? Why else would she have said to me when I told her I was getting married, “My friends all believe you are pregnant and have to get married”? Why else would she have said to me when I told her I had been accepted into a graduate program at one of the state universities, “That will be a waste of money. Look at how poorly you did when you were an undergraduate”? I didn’t tell her that I had done so poorly because I had tried to flunk out. After all, I had not chosen to attend college after I graduated from high school–I wanted to work for a year. But my parents forced me to go to school. In my still-adolescent mind, I reasoned that if I flunked out of college, they would see that I was right and they were wrong. However, I failed to fail. I failed to fail, and in failing to fail, I failed myself. That failure added a few inches to the girth of my red balloon! Well, the facts are in, and the data point to one major piece in the puzzle of my life: I was not wanted, and my parents were not happy to see me. Even before I was born, my mother rejected me emotionally. After I was born, of course, I experienced further neglect. And what is the relationship between this basic neglect and parental refusal to relate to me as a human being and this red balloon that has dogged me all my life? My red balloon has been filled not with helium but with the devastating and excruciatingly painful sense of isolation and loneliness that a baby experiences when she cries and nobody comes. Nobody comes to comfort and soothe the baby and to reassure her that, yes, she is loved and cherished. Nobody comes to tell her she is valuable and worthy of attention. Nobody comes to smile at her and play with her and enjoy her laugh. Nobody. Her despair inflates the balloon, and the balloon grows larger as the little girl grows older. It dogs her heels until she considers ending her young life just to separate herself from that balloon. But she doesn’t end her life. She just keeps putting one foot in front of the other and does her best to raise her children, be a wife, and earn an income. Finally, when she is in her early forties, the balloon swells to the point where the woman fears for her life. The balloon engulfs her, threatens to cut off her air supply. Does she give in, or does she continue to struggle, continue to put one foot in front of the other? Desperate and thinking about her children, the woman asks for help. And to her complete amazement and joy, her cry is heard and somebody comes. At long last, somebody comes! And thus begins this woman’s journey on the road to healing. If you have been following my blog, you know my story from this point. I’m not quite “there” yet, but I’m getting there. And now that I am aware of my red balloon, the roots of my essential depression, I’m going to work at deflating it, rendering it powerless. Doing this will be, I believe, a giant step in my journey toward healing. “With awareness comes change,” and with change comes healing.